The next defense witness is Roger Dixon. He is qualified as a geologist. 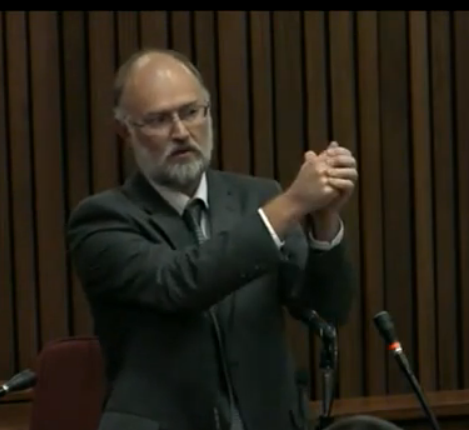 He worked in forensic science at SAPS from 1994 to 2012. 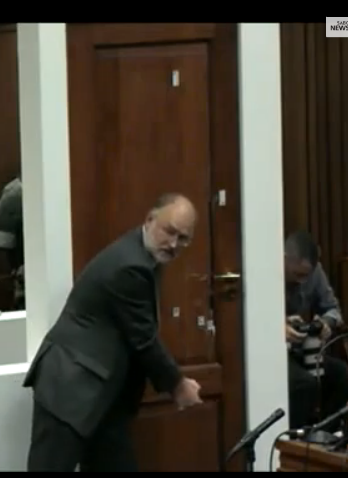 He was previously the head of the department that Vermeulen (the State’s bat expert) worked in and Vermeulen is now the head. He has testified in court before although not often. He estimates about 3-4 times per year. The first item he was tasked with by the Defense was to examine the lighting of the bedroom. He went to Oscar’s home and closed the curtains, switched off all the lights and then looked around to see what he could see. With all lights off, including electronic equipment, on a dark moonless night you could only see a little bit of light at the end of the passage to the bathroom. The room was completely dark. He could not see his hand in front of his face. He did this on March 25, 2014. He said he picked a moonless night because that was the condition on Feb 14, 2013. In the bedroom close to the bed are two light switches. They have tiny blue lights on them but they do not give off light. The CD player (amp) light does gives off a little bit of light, but only enough to see your hand in front of it. With your back to that same light, you can’t see in to the darker areas of the room. He also testified that when you first close the curtains and turn around, your eyes take a while to adjust to the pitch darkness. If you stand in the room for a while and your eyes become accustomed, you will start picking up shapes in the room, but it’s not quick. Dixon confirms that the light in the toilet was not working. All the lights to the bathroom are controlled by one switch which is on the right hand side of the entrance to the bathroom. The bulb in the toilet room was not functional. 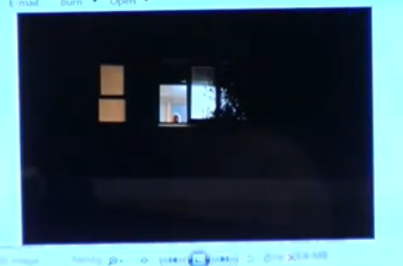 On March 25, he also went to the outside of the Stipps house. Since February 2013, a new home has been constructed in between Oscar’s house and the Stipp’s house but if you look past the corner of it, you can still see approximately in that direction. They stood in the street with the Stipps house to their backs to do their testing on the bathroom. 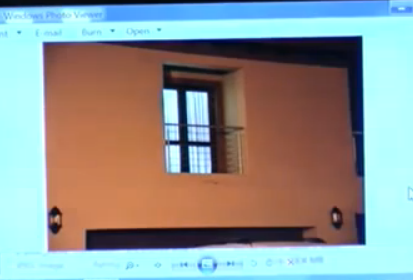 The photo depicts the small balcony off of the Stipps’ bedroom which is just above their garage. Their backs were facing this part of the house during the tests. 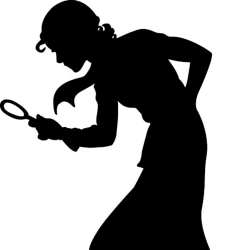 Roux mentions that it was the evidence of Mrs. Stipp that their bedroom curtains are always open. He wants to know what Dixon sees in this picture. Dixon points out that the curtains are draping fully closed without being pulled back. He’s trying to discredit Mrs. Stipp. I’m not surprised that their curtains are closed. They are witnesses in a murder trial and the defense has been conducting tests near their home for several months. I would close my curtains too! Dixon first took a photo of Oscar’s bathroom with all of the lights off. The photo is basically black depicting the pitch black condition of the home with no lights on. Next they look at a photo of the inside of the bathroom. A replacement door has been put in the frame. The next photo shows a model kneeling on the floor, which is intended to depict Oscar on his stumps. The purpose of Roux showing this photo is also to discredit the Stipps’ testimony about seeing a figure walking in front of the window that night. This photo shows the bathroom with the lights on and the toilet room door fully closed. The toilet room light is still not working and the toilet room is not visible from outside without that light. 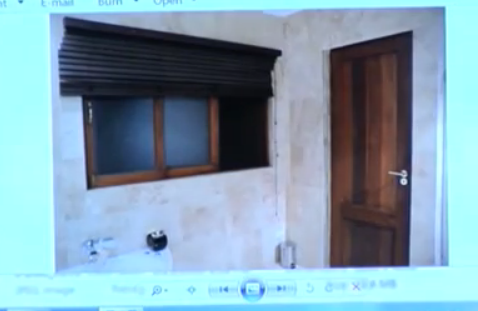 The next photo shows the bathroom with the lights on and the toilet room door slightly open. Dixon said the degree of lightness in that toilet room increases the more the door is open. This photo shows the toilet room door totally open. The toilet window is much brighter now and the door also obscures a good portion of the open window. The model can now be seen in the middle of the frosted window. 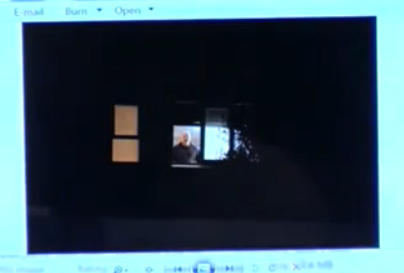 You can no longer see him clearly; he looks more like a silhouette behind that window. They then look at a photo where the model is on his knees facing outside. The toilet door is slightly open. For reference, the window sill is approximately 1.1 meters above the ground. 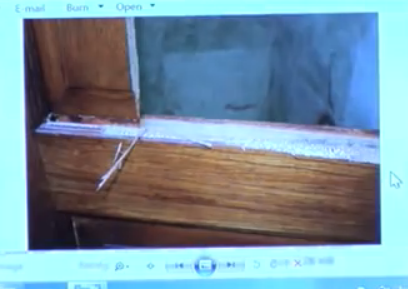 Dixon testifies that he has examined the bathroom door. He believes it was done on November 8, 2013. 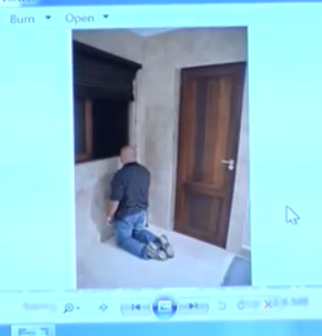 This examination was done at Oscar’s house and the door was reinstalled by the SAPS. 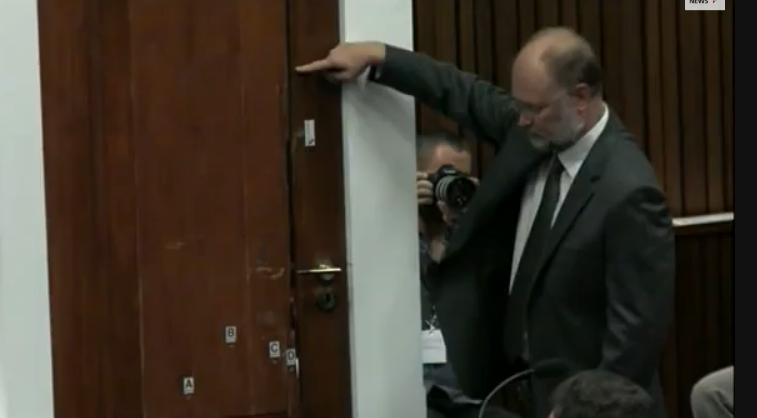 Then on November 15th they went to the forensic laboratory in Silverton where in the presence of Vermeulen and Mangena, they examined the door again. 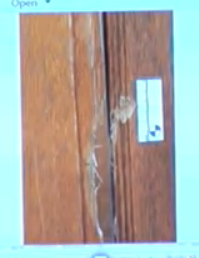 Dixon’s finding was that the damage on the right side of the door was caused by a cricket bat that hit it very hard. He said the marks on the side of the frame and on the inside of the doorframe on the panel are consistent with damage by hard blows of a cricket bat. The exam showed that there were probably only 3 blows. 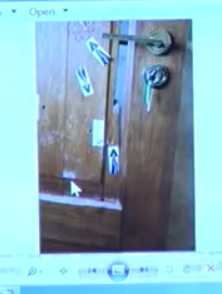 They look at a police photograph of the door and the labels that were put there by the police. 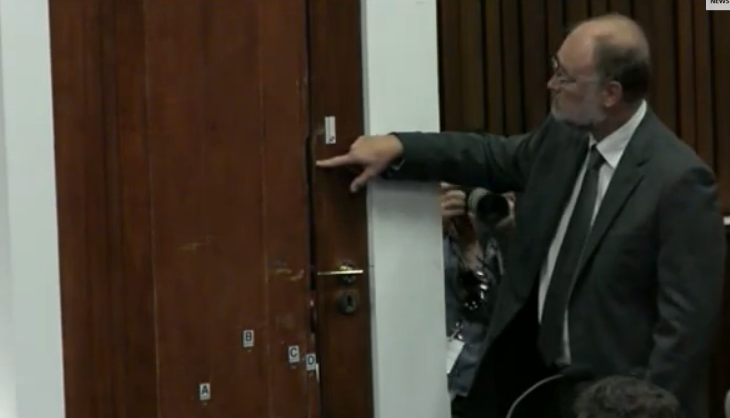 Dixon now demonstrates on the door in court where the cricket bat hit the frame of the door. He believes this was the first hit. Another bat strike hit in this location. And one more bat strike hit here. Roux asks him if he ever tested the sound of the cricket bat on the door. 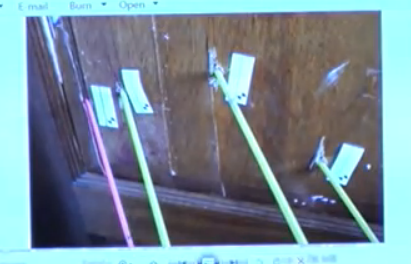 Dixon says in order to test whether the bat did hit the door, they took a duplicate door from the house made of the same wood and design and did conduct tests. They hit the door with the bat and they fired bullets through it in order to replicate the effects. Dixon was the one who hit the door with the bat. The tests were done on a shooting range at night in order to eliminate as much extraneous noise as possible. One recording station was at 60 meters and the other was at approximately 180 meters. 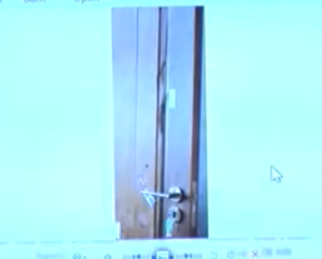 The test door was situated so that it was at the same angle to the recorder as the real life door would have been to the window. They prepare to play the tape and Oscar plugs his ears in the dock. Dixon states that they first recorded the sounds at a distance of approximately 60 meters. 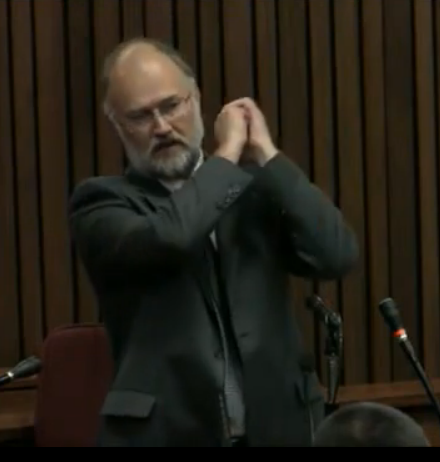 He did three bat swings wielding the bat over his head as Oscar stated he did in court. This was the first set of sounds heard on the tape. He next did four bat swings in rapid succession with the bat low and in a batting position, hitting the door with the tip. This was the second set of sounds heard on the tape. 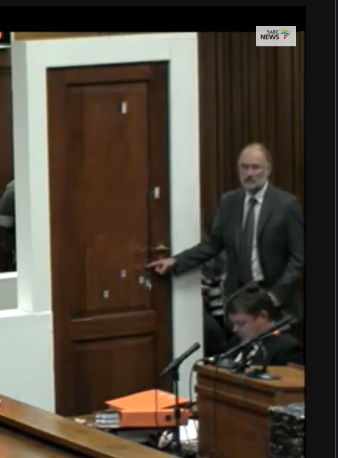 They now move on to some further analysis of the door. The next picture shows the bullet hole D. It has a crack running through it. 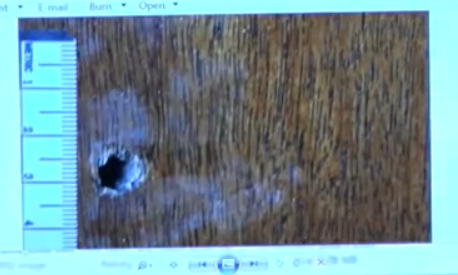 Dixon believes that this bullet hole was in the door first prior to the cricket bat creating the crack. 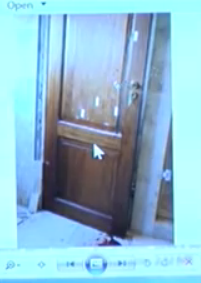 If the crack was there first and the bullet hit it, it would have likely taken a chunk out of the door. 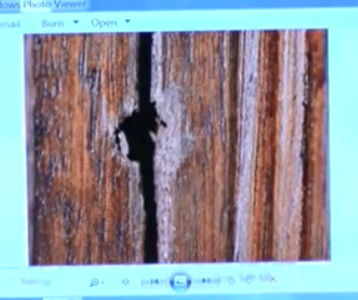 He also points out some spots of blood that can be seen just above the bullet hole on the left portion of the crack. He says the reason why one side of the crack has blood on it and the other doesn’t is because these pieces of wood likely fell in two different directions on to the floor. The next photo is from their testing. They first put a crack in the door with the bat and then they fired a hole through it. 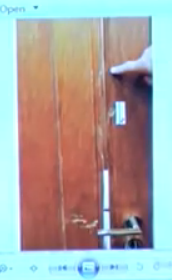 He points out that this crack is continuous whereas the crack on the actual door is not. The next photo they look at is the abraded area on the door panel. 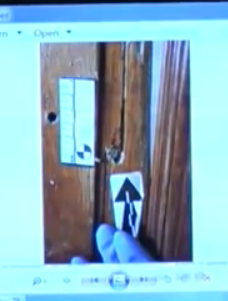 Dixon also points to where it can be seen on the door in court. Dixon points out that varnish is smooth and when you make varnish rough, you get a light reflection like you see in the photo. At the top of the abrasion just below the curved edge you can see two white spots. 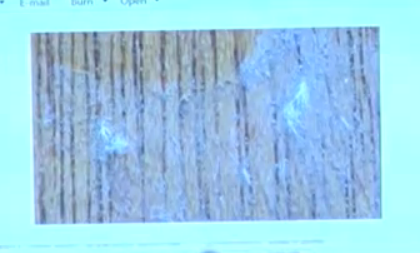 Dixon says that these are white fibers stuck in the varnish. He also says that in reconstructing this scene, the only material consistent with the fibers is the white sock worn over the prosthesis of Oscar. Roux introduces the next photo. This is the sole of the right prosthesis. He points out with the white cursor an area that has vertical striations and a chunk missing. 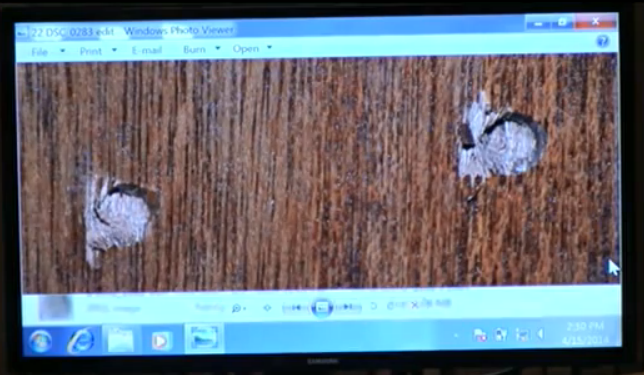 Dixon says this was caused by the foot impacting on the door. 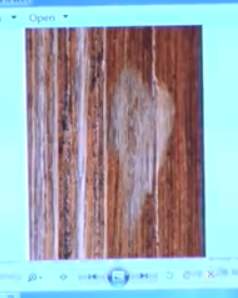 The dark vertical striation is from the varnish of the door. He says only a forceful kick upwards could cause that. 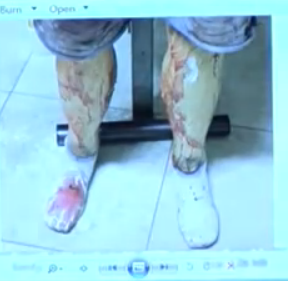 They next look at a picture of Oscar’s prosthetics as he was wearing them that night. Dixon says the fibers that were stuck on the door match the fibers of these socks. Roux wants to know if it’s possible that the mark could have been caused when the panels were on the floor and Oscar stepped on them. Dixon does not believe that the act of stumbling or stepping would give sufficient force to cause that damage. In this next image, Dixon’s finger is pointing to the top most impact point of the cricket bat. And in this side view image of the door, you can see two bat impressions one on top of the other next to the white marker. He believes that the mark on the bottom was the hardest blow that broke the panel. The panel is at its thinnest in that location right on the edge of the frame. 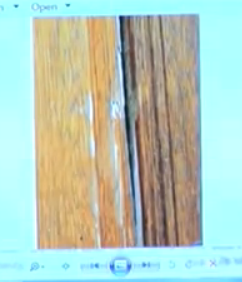 Dixon testifies that the wood is meranti and it is splintery and brittle. There would have been lots of splinters that broke off along with the panel itself. The door is not fitted in to the doorframe such a way that it is completely firm. The walls around it consist of brick, plaster and tiles on top. He believes that when the first blow struck, there was a strong vibration. That vibration went through the door to the outer jam and caused the tiles and plaster to fall. 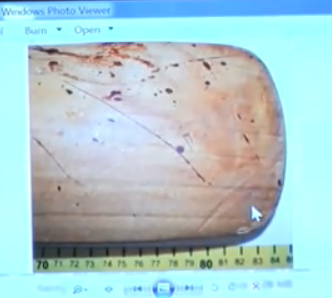 The next image shown is a close up of the top mark, the mark that the defense believes is the 3rd bat mark that Vermeulen didn’t identify as being caused by the bat. 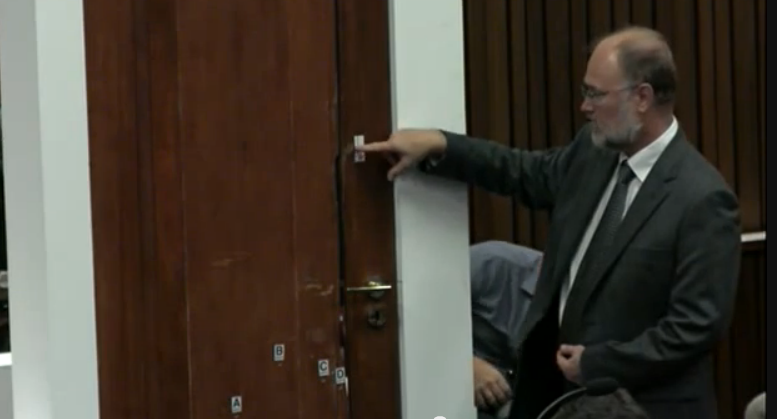 Dixon believes that this strike would not have been sufficient enough to break the panel in. An image of the cricket bat is now shown and the white cursor indicates where there are grooves from the door. Dixon says cricket bats are made of English willow. It is a fine grain wood and its lightweight. When these bats are manufactured, they are created to survive the repeated blows of cricket balls therefore they are subjected to compression so there are no air pockets in the wood. The tip of the bat is very dense. The meranti wood has much larger cells and is splintery. When it is hit hard, the wood will snap and throw splinters. The next image is a close up of the strike to the frame, the first hit, which was very hard and caused the tiles to fall. And this photo depicts the test that Dixon conducted on the door. This was his bat mark on the same area of the door frame. He says he hit that frame quite hard but he didn’t have the strength to cause the same damage that Oscar caused on his door. This photo, which was taken by Col Motha, shows the door from the inside of the toilet. This was the original reconstruction. 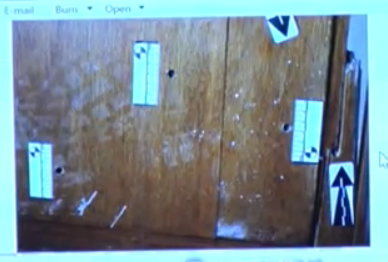 He points out that on each bullet hole there is wood splintering in a vertical pattern to the left. And this photo is taken from the outside of the toilet room, looking in through the broken out panel. He points out that the panel in the door was one big piece. The fact that it was found in multiple pieces shows that it was ripped out in pieces. The white cursor in this photo is pointing to plaster dust. A shoe print can also be seen to the left of that. This next photo shows a better view of the shoe print in between the two bullet holes. 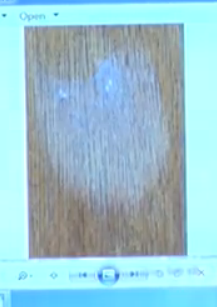 Dixon testifies that this shoe print could only happen if somebody walked on it. Roux wants to know how this fits in with the preservation of a crime scene. Dixon says, “it is most unprofessional.” He goes on to say that upon arrival at the scene, unless there is an urgent need to save a life, there is no pressing need to walk around the scene. The first person there should secure it first. 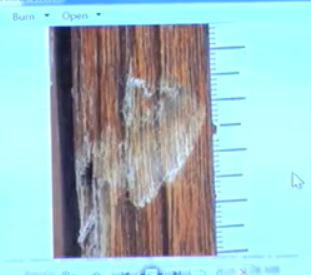 They show another close up of the bullet hole with the plaster dust shoe print over it. The next holes are the test shots that were fired by Dixon and Mr. Wolmarans on the test door. This is the same door that they used for the cricket bat testing. This was done at an indoor shooting range. This photo depicts the entry point of the bullets. These were taken at a right angle, slightly downward. And these are the exit points of the bullets. During the test firing, this board was placed behind the door and used to determine the distribution of the wood splinters. You can see where the bullet hit. And then above that, all of the black specks are where the splinters were distributed. 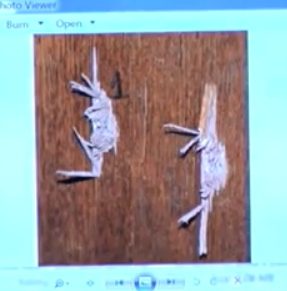 Dixon reviewed autopsy photos (which they do not show in court) to see where the wood splinters were lodged in the deceased. 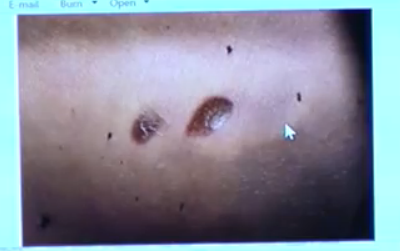 He says that after she was washed and then photographed, you could see small punctures, not bruising, around the hip entry wound. On the arm, there was a patch of wood splinters. There were also some larger wood splinters at the waist level. He says these were caused by being at close proximity to the door. Roux asks him how close is “close proximity”? 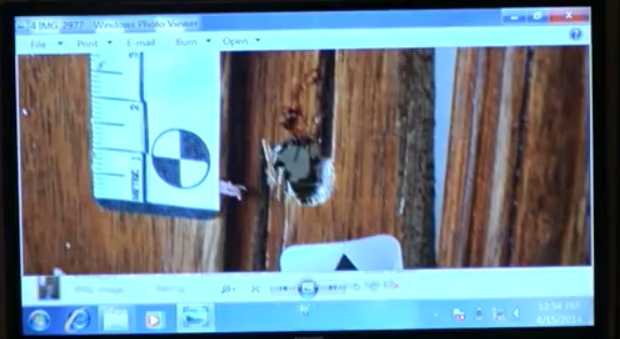 Dixon says based on his testing, at 20cm away from the door, there were very few splinters. He says it is possible for some larger pieces to travel further. They did put their board at various distances and at 60cm they only got one or two splinters. •	At 6cm, quite a lot of splinters. •	At 10cm, they still got quite a lot. •	At 20cm and further, there was a sharp drop in the quantity. Taking this in to consideration, when he looked at photos of the arm of the deceased he inferred that the arm was stretched out, above bullet hole A, leaning towards the door handle. There were splinters on her forearm as well as on the top portion around the wound. There were also pieces of wood found on the fabric of her t-shirt. Dixon believes that the upper portion of her arm, as well as her forearm, were close to the door when the wound was inflicted. 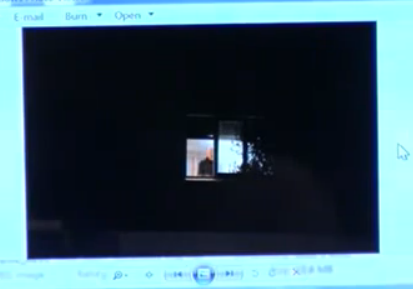 Next is a photo taken by police on February 14th at 5:42am. These are the contusions on her back. Dixon says that what they see on this photo was not seen in subsequent photos due to the moving and washing of the deceased. In addition to the two large dark contusions, there is also a bruise to the right where the white cursor is pointing. The bruise is located right at the area of the spinal process. The striations that are seen on the largest abrasion are almost vertical in nature. 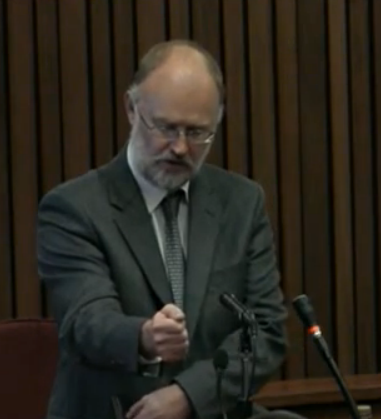 He believes that these occurred when Reeva fell against a hard, blunt object. 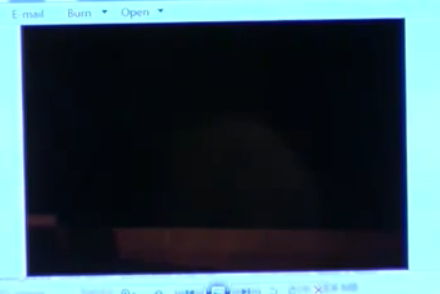 The next image is not shown on the screen in court but I was able to get a screenshot of Dixon holding the photo. 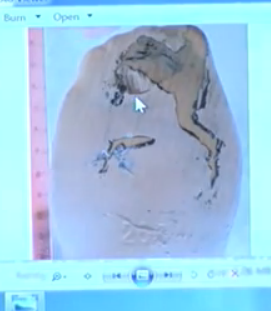 It shows the backside of the deceased with a white scale pointing to where the abrasions were located on her back. They appear to be higher up than I anticipated. I think this may lean in favor of the bullet fragment hitting her back and not the magazine rack because I don’t see the rack hitting her that high up. Lividity has set in so there is now redness in the area and the bruising that was previously seen to the right of the contusions can no longer be seen. But what can be seen is on the inside middle of the right buttock is a severe vertical contusion which is blackened. Leading outward towards the outside of the buttock, is a bruise line that is slightly curved. 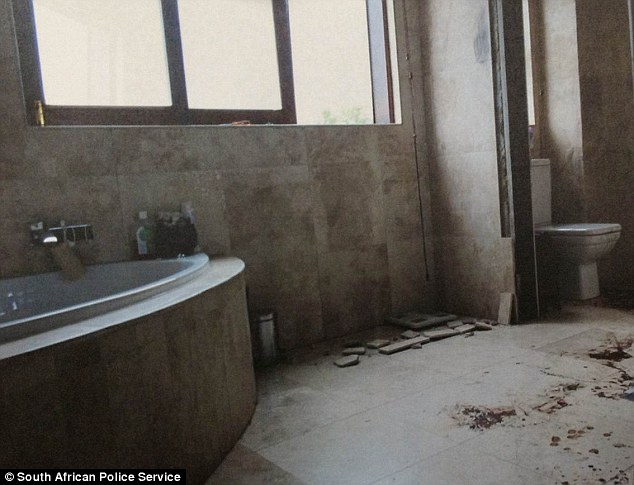 According to Saayman’s autopsy, he could feel nothing inside the buttock, no objects, that would have caused that. In Dixon’s opinion, the positioning of that bruise is consistent with the deceased having fallen hard against the magazine rack. The sideways projecting bruise could be the edge of the magazine rack. 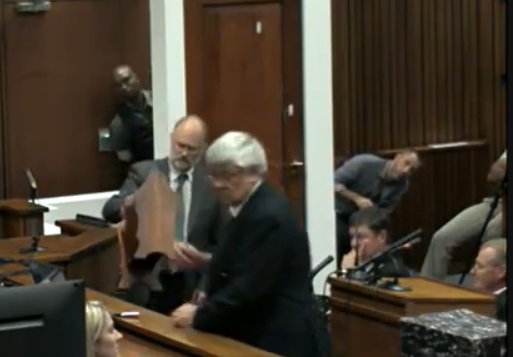 Dixon is then given the original magazine rack in court. He believes her buttocks and her back hit the front of the rack as she was coming down. 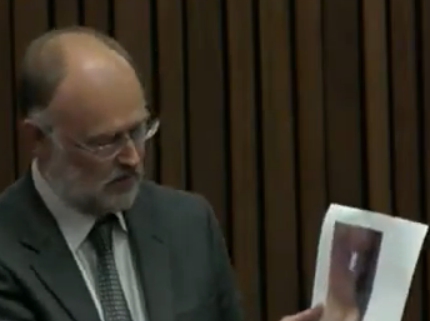 Roux informs Dixon that Mangena’s testimony was that Reeva was seated on top of the magazine rack when the 3rd and 4th shots hit her, and there was also a shot that missed her and ricocheted off the wall hitting her across the back causing the two marks. He wants to know what Dixon thinks about that. Dixon believes that if this were the case, the bullet would have to be smooth, so as not to cut the skin, and also traveling upwards in order to get the vertical striations that were seen. He doesn’t see this happening. 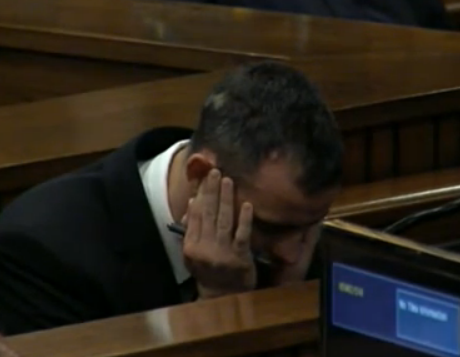 Roux asks him if he knows about the projectile that was found in the toilet bowl. He says yes, it was a bullet core. It was found after the initial investigation by police. The size of the bullet core is inconsistent with having come from one of the bullets that penetrated the body and fragmented. 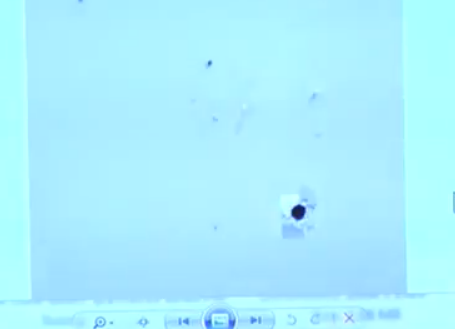 Therefore, theorizing that this is the bullet that ricocheted off the wall and missed her. 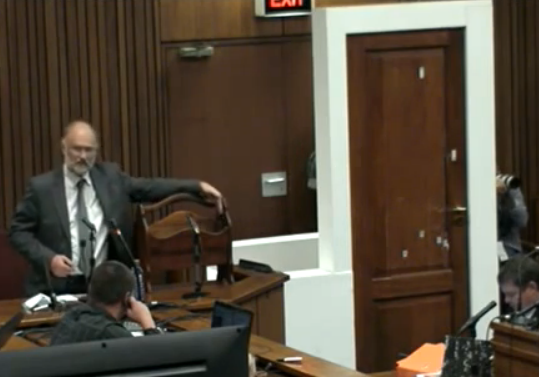 Dixon can’t conceive of a scenario where the wounds on the back would be caused by a ricochet. Forgot to mention that it was SO painful watching Dixon that I couldn’t watch it live. I had go back a couple days later. That guy was a DISASTER from word one. A geologist????????? and it only went downhill from there. Also, he has such an odd personality. Anyone could have done better work than that guy did just by using common sense. NOW PLEASE THINK ABOUT THAT LINE OF LIGHT AND HOW IT WOULD BE OBVIOUSLY GREATLY INTERRUPTED BY A PERSON STANDING BEHIND THE CURTAIN. The visual clue of a person being there would stand out and the converse is also true in that it would be clear that no one was standing/hiding behind the curtain. The visual clue that no one could possibly be behind the curtain is a substantial point. There would be no reason to feel the curtains to check for somebody hiding behind them. OP’s concocted version of events is thus seriously undermined on this point which adds to its utter implausibility.